Another building visible in the drawing at the foot of the previous page is the theatre in Alston Street. The first theatre in Glasgow, close to the Cathedral, had been demolished by a large crowd of people in 1754. The crowd had been urged on by George Whitefield, one of the more evangelical leaders of early Methodism. The religious authorities of Glasgow strongly opposed the construction of another theatre within the boundaries of the city, and it was for that reason that a theatre was built in Grahamston. The group of men responsible for developing the theatre were able to attract George Anne Bellamy, often know as Mrs Bellamy, to perform on the opening night and to continue to direct plays and musical concerts over the next two months. At that time Mrs Bellamy, one of the most well known actresses in Britain or Ireland, was at the height of her career. George Anne Bellamy has featured as Tart of the Week in the splendid blog entitled The Duchess of Devonshire's Gossip Guide. Mrs Bellamy travelled from Edinburgh to Glasgow on 24 April 1764, two days before the opening night of the theatre. On her way she was given the news that a crowd of people had broken into the theatre. They started a fire that caused damage to clothes and other goods, they destroyed parts of the theatre, and they carried away sundry goods and effects. Undeterred Mrs Bellamy organised immediate repairs, rehearsals were completed, and the theatre opened on 26 April. The advertisement for the opening night in the Glasgow Journal for 26 April 1764 read: By particular desire at the NEW CONCERT HALL this present evening will be a CONCERT of MUSIC between the parts of which will be presented gratis a Comedy called the CITIZEN, to which will be added a Farce called HIGH LIFE BELOW STAIRS, to begin exactly at 5 o'clock. Church leaders continued to proclaim their moral outrage at the presence of the theatre. Then early in the morning of 5 May 1780 a fire started in the building. Fire engines attended and their staff were praised for saving neighbouring buildings. The external walls of the theatre survived but the whole of the interior, with clothing and scenery, was totally consumed. An eye-witness account of this incident was given later by James Cleland, who lived nearby and was ten years old at the time. According to his account the magistrates directing the firemen instructed them to save the ither folks' hooses an' let the Deil' s hoose burn. The theatre was not restored. It remained empty for a few years and was then converted into a granary. 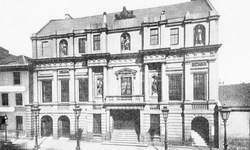 A statue of Shakespeare that stood at the front of the Alston Street theatre was removed and installed in the facade of Glasgow's next theatre, opened in Dunlop Street in January 1782. The statue had to be moved again when that building too was destroyed by fire in 1863. It came to rest in the grounds of a large Victorian house in Carmunnock. James Cleland, mentioned above, had an outstanding career in the administration of Glasgow early in the nineteenth century. Born in 1770, about a year later he moved with his family into Alston Street, by then the main street running through the centre of Grahamston from Argyle Street. Cleland was a superb statistician. He could tell you how many executions took place in Glasgow between 1767 and 1820, the breadth of the River Clyde at the west end of the Broomielaw, or the number of livestock slaughtered in Glasgow from 1 June 1817 to 1 June 1818. Answers: 52 including 12 for murder and 5 for forgery; 140 feet; 12,716 bullocks, 8752 calves, 43,273 sheep, 45,062 lambs. From 1814 until his retirement in 1834 James Cleland was Superintendent of Public Works. He was responsible for standardising the system of weights and measures, making himself unpopular with the city's spirit dealers when he confiscated many of their measures. He divided Glasgow into nine parishes. 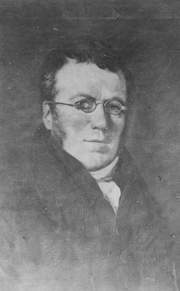 He co-ordinated the censuses of Glasgow in 1821 and 1831. He also found time to publish several books with facts and figures about the city, and contributed the section on Glasgow to the New Statistical Account of Scotland. For more information on James Cleland read an article by an un-named author in the Glasgow Chamber of Commerce Journal, July 1971, 289-291 or go to the Electric Scotland website. The theatre in Dunlop Street that replaced the Alston Street theatre. The statue of William Shakespeare can be seen in the centre of the top floor.